Authored by: W. Thomas Smith, Jr. The Central Intelligence Agency (CIA) is one of the most fascinating yet least understood intelligence gathering organizations in the world, and much of their inner workings remains classified. The mere mention of the CIA evokes images of covert agents operating under a veil of secrecy in remote regions of the world. However, only a small fraction of the thousands of CIA employees serve at the agency's clandestine tip of the spear. Encyclopedia of the Central Intelligence Agency is the first single-volume A-to-Z reference to this mysterious, complex, and often misunderstood branch of the U.S. government. The ultimate resource for both casual readers and researchers, this comprehensive encyclopedia provides detailed descriptions and definitions of key CIA terms, players, equipment, operations, and parallel organizations. It also discusses perceptions of the agency in popular culture, including its portrayal in film, television, and fiction. 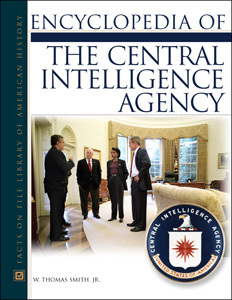 A one-stop resource, it contains an introduction that surveys the history of the American intelligence community from the colonial era to the present, four informative appendixes, and an extensive bibliography. "...[a] comprehensive, A-to-Z resource...user-friendly, informative..."
"Smith's resource contains little known facts that will delight and entertain...tight, well-organized information presented in an easy-to-read format. Smith has compiled an exhaustive resource of CIA trivia that will answer some of the most obscure questions." "...the book brings together a large array of pertinent detail and will be useful in high-school, public, and academic libraries." "Engagingly written, the book is eminently readable and informative, not to mention fun to browse. It should draw the casual reader and researcher alike as a useful and convenient source of background information. As befitting a good reference title, little known facts will delight the curious...belongs in all libraries with strong current affairs collections." "...an excellent reference source...engaging...practical...a useful addition to reference collections for all libraries." "The casual reader or the serious researcher will find this definitive single-volume reference source comprehensive and fascinating...This belongs in every secondary school library...Highly recommended."